1 voucher is valid for 1 pax. Minimum 2 to go & must travel together. 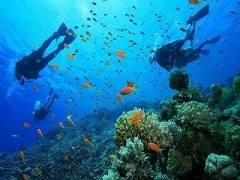 3D2N TIOMAN ISLAND, MALAYSIA [HOTEL + COACH + FERRY]: $149.90 per pax for 3D2N stay at Paya Beach Spa & Dive Resort + Daily Breakfast + 1x Lunch + 2x Buffet Dinner + Snorkeling Excursion to Renggis Island & Marine Park + Return Coach & Ferry Transfers! Min 2 to go. • Snorkeling Excursion to Renggis Island & Marine Park (Exclude equipment/Entrance Fees) or Trekking Trip To Rockfall through rainforest.